Vancouver, Canada - Mawson Resources Limited ("Mawson") TSX - MAW; Frankfurt - MRY. Mr Michael Hudson, President & CEO, is pleased to report bonanza-grade gold and uranium results from surface sampling at the 100% owned Rompas project, recently acquired from AREVA NC ("AREVA") in Finland. 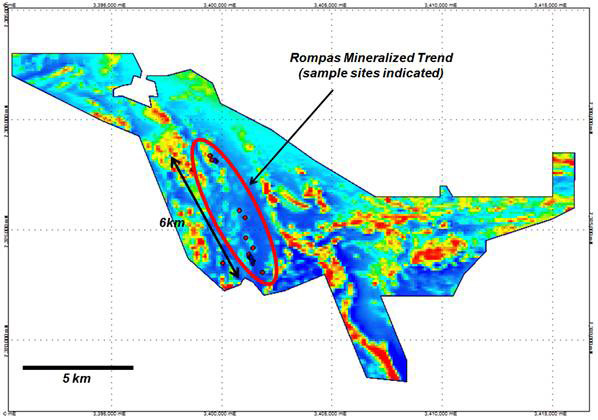 AREVA selected 20 samples for assay from 150 radiometrically anomalous sites discovered to date at Rompas over a NNW-SSE trending area 6km long by 200m wide. During due diligence, Mawson collected 21 bedrock samples from two zones, the first area 400m X 100m and the second area 120m X 50m in size within a 5km strike trend (Table 1). Rocks collected by both companies for assay were grab samples taken from outcropping rock. Grab samples are selective by nature and are unlikely to represent average grades on the property. 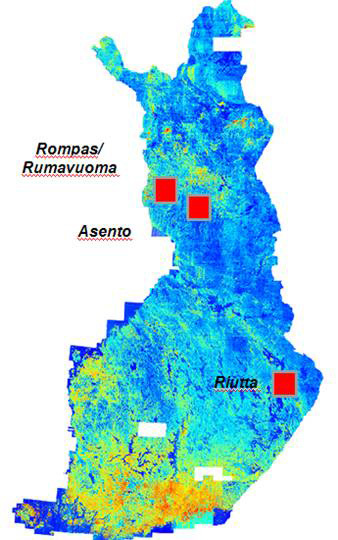 As is typical for Northern Finland, outcrop in the project area is not common. To date, no systematic channel sampling across structures has been undertaken. Of significance, some samples assayed high gold without elevated uranium, providing scope for the discovery of gold-only mineralization. Mineralization continues at the extremities of the 6km trend under glacial soil cover. Mineralization appears to be hydrothermal in nature and fracture-controlled, hosted mainly by metavolcanics which may in part be skarnified and/or hornfelsed. Uranium is found in the form of uraninite. Native gold and uraninite are generally identified at surface in limonitic fractures within metavolcanic host rocks. Mr Hudson states, "Rompas is an exciting new gold and uranium discovery made by AREVA in Finland, now 100% owned by Mawson. This flagship project clearly defines Mawson's status as a gold and uranium explorer. To find such high gold and uranium grades at surface in an area with no previous exploration or drilling provides Mawson with a tremendous discovery opportunity. The broad extent of high grade samples over 6km of strike is extremely encouraging. We look forward to a busy and exciting summer field program in Finland." Mawson is planning an active 2010 summer field season at Rompas including geological mapping, geochemical sampling and airborne geophysics. Full details of the program will be released shortly. The Company will benefit by employing many of AREVA'S geological team responsible for the initial discoveries. The Rompas project is secured by claim applications and drilling and trenching will be permitted on granting of exploration claims. The granting of claims in Finland is currently slow and Mawson will work with the authorities to facilitate this process in the shortest possible time. Mawson has already been working in conjunction with AREVA to engage consultants who shall provide expert opinion on Natura 2000 areas contained within the project area. In addition, a NI43-101 technical report is under preparation and is expected to be finalized and filed shortly. AREVA is a major shareholder of Mawson, currently holding 11% of the Company, plus an option to purchase an additional 8% by exercising 4.2 million purchase warrants at $1/share. The portfolio purchased from AREVA totals 16,156 hectares and doubles Mawson's strong claim position in Scandinavia. Mawson is compiling information from three other projects recently acquired from Areva and will release further information as it becomes available. Mawson Resources Ltd is a natural resource acquisition and development company with METAL and ENERGY interests. Mawson has distinguished itself as the leading Scandinavian uranium exploration company, with advanced projects in Sweden and Finland. As the European Union moves to reduce its reliance on carbon-based energy sources and continues to debate energy security, Mawson is well positioned to provide Europe with the option to fuel its future. Areva NC holds 11% of the Company and provides Mawson with an active technical partner. In addition, the Company is exploring for gold and copper in the highly prospective Cordillera of Peru, with a focus on a new high grade gold discovery at Alto Quemado. With a strong cash position and a multi-jurisdiction European and South American portfolio, Mawson is ideally positioned to enhance its status as a leader in the uranium and gold industries. Shares Outstanding: 42,697,253. Cash: approximately C$9.5 million. Forward Looking Statement. The statements herein that are not historical facts are forward-looking statements. These statements address future events and conditions and so involve inherent risks and uncertainties, as disclosed under the heading "Risk Factors" in the company's periodic filings with Canadian securities regulators. Actual results could differ from those currently projected. The Company does not assume the obligation to update any forward-looking statement. The TSX Exchange has not reviewed and does not accept responsibility for the adequacy or accuracy of this release. Quality Control. Mawson samples were analyzed by ME-MS81, U-XRF05, XRF-10, Au-GRA21 and Au-AA25 techniques by ALS Chemex Ltd's laboratories in Pitea, Sweden and Vancouver, Canada. Areva's samples were assayed at the Labtium Oy laboratory in Rovaniemi, Finland by methods 511P and 704P. The results of the duplicate laboratory analyses appear to be acceptable however no field standards or blanks were included in the sample stream. The qualified person for Mawson's Finnish projects, Erkki Vanhanen, Finnish Exploration Manager for Mawson with a designation of European Geologist for the European Federation of Geologists (EFG), has reviewed and verified the contents of this release.